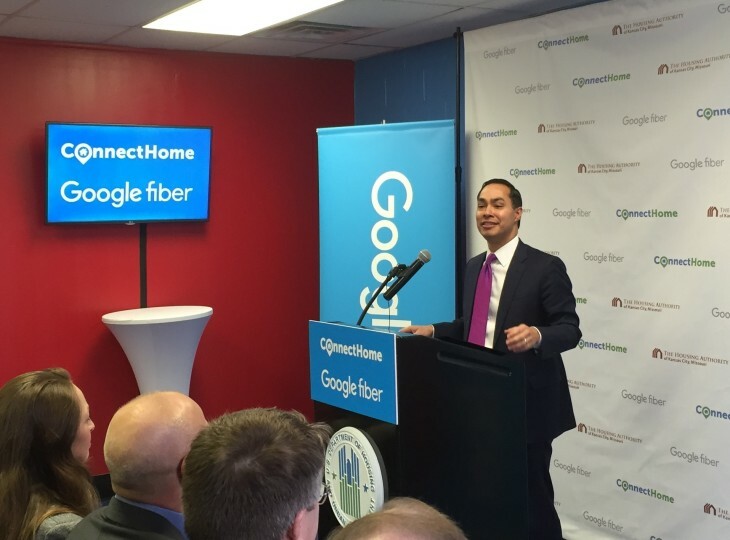 HUD Secretary Julian Castro announces the arrival of free Google Fiber gigabit Internet to low-income housing residents through ConnectHome. A crowd of nearly 60 community leaders, politicians and press piled into the cramped office of a low-income housing complex on Kansas City’s Westside this morning to hear the news that Google will start bringing free gigabit speed Internet to all to low-income residences connected to Google Fiber. This ambitious assault on the digital divide comes through the U.S. Department of Housing and Urban Development’s (HUD) ConnectHome initiative. Kish was joined at the podium by HUD Secretary Julian Castro, local Google Fiber Community Manager Rachel Merlo, KCMO Mayor Pro Tem Scott Wagner, Housing Authority Executive Director Ed Lowndes, and West Bluff resident Tamara Butler. The news that Google Fiber will provide free gigabit Internet to affordable housing residents in all its markets is a significant increase in commitment from this past July, when Google pledged to bring normal-speed broadband to families in ConnectHome properties. Beginning with the 100 homes in West Bluff, Google Fiber will provide a network box and free connection to nine more HUD properties in Kansas City, servicing 1,300 families. These families will be able to purchase low-cost computers from ConnectHome partners Connecting for Good and Surplus Exchange. But the loudest voice in favor of the program came from Tamara Butler, a soft-spoken West Bluff mom. Butler described the struggles of not being able to afford home Internet when schools have replaced textbooks with online materials. Local libraries offer free computers and wifi, but they aren’t always reachable through public transportation. 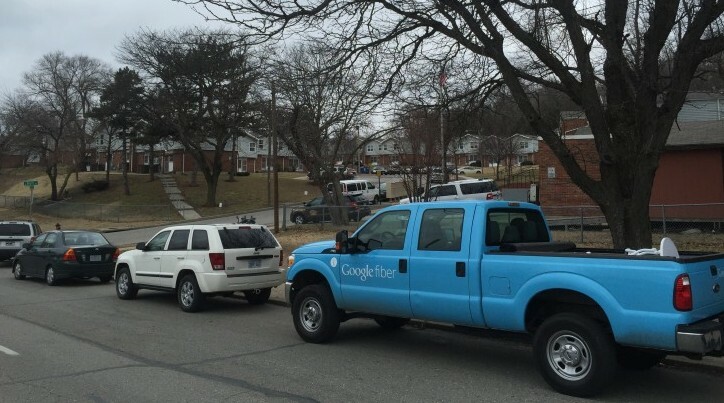 Google Fiber is providing free gigabit to West Bluff and 9 other HUD properties in Kansas City. KC Digital Drive is excited to see Google Fiber continue its investment in bridging the digital divide in Kansas City. (Full disclosure: Google Fiber is a Silver Founding Sponsor of KC Digital Drive.) Our position has always been that regardless of who’s providing it, gigabit fiber is the infrastructure of the future. And we do mean gigabit — regular broadband does not have the capacity to support the kinds of bandwidth usage that multi-device homes and future web applications will require. But it’s not a magic bullet. Bringing fiber to the home is the first step in closing the digital divide, but people must have the skills to take advantage. This spans from learning basic literacy to having the ideas and the resources to create the apps of the future that will improve our quality of life. To promote digital literacy in our community, KC Digital Drive manages the KC Coalition for Digital Inclusion. This gathering of resource providers includes ConnectHome partners like Connecting for Good and Surplus Exchange; educational institutions like Metropolitan Community College, KC Public Library, Mid-Continent Public Library; community not-for-profits like Literacy Kansas City and aSTEAM Village; and ISPs like Google Fiber, AT&T and Verizon. We meet on the first Friday of each month to share resources for ensuring that people who have access to gigabit fiber understand why it is relevant and how they can use it to improve their lives in the digital economy. To drive next-generation innovation using fiber, we work with national partners like US Ignite and Mozilla to bring opportunities, funding and resources to those seeking to use technology like the gigabit Internet to start new businesses and public-impact programs. These concepts will be discussed at the IEEE Smart City Workshop Feb. 8-9 at the Sprint Accelerator, and they will be explored in live demos supported by the Mozilla Gigabit Community Fund and the US Ignite/NSF Smart Gigabit Communities program, both of which are White House-backed initiatives taking place right now in Kansas City. To bring together healthcare innovators and get them working with tech volunteers to solve community health problems, we are hosting a health data project charrette for the national CodeAcross celebration on Saturday, March 5. It’s free, and we’re seeking coders, stakeholders, and volunteers. Sign up here. Finally, we’ll tie together digital inclusion and next-gen innovation at our national Gigabit City Summit conference, May 16-18, 2016, at the UMKC Bloch Executive Hall. These are just some of our programs. Browse the Playbook for more. In conclusion, we applaud Google Fiber and HUD for bringing gigabit speeds to families in KC who need it most. We look forward to working more with the ConnectHome partners, US Ignite, and others in our network to take our community, and our region, forward to the future.